Genuine solid 14k gold high quality fashion pendant jewelry charm. Great gift for any Mens or Womens occasion. 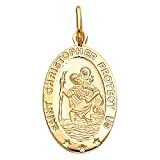 Solid 14k Yellow Gold Saint Christopher Pendant Medallion Protection Charm Genuine 23 x 15 mm.